Our back is under constant stress at all times. As a result, it is not surprising that individuals can develop back pain. 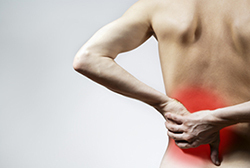 In this article, we shall briefly review the common causes of back pain. In order to maintain a strong back, we are required to have a good diet in maintain a healthy body weight. Unfortunately, in this area of fast foods and junk foods, obesity seems to have become a big problem. Weight gain can place a great deal of stress on the back, and can cause back pain. Calcium and vitamin D are essential elements required to maintain the structural integrity of the bones. Insufficient amounts of these can cause thinning of the bones and back pain. Leading a sedentary lifestyle or having a sedentary job can all result in weight gain. Regular exercise keeps the body fat levels low, keeps the bones strong and keeps the ligaments and joints supple. Insufficient exercise can result in all this becoming stiff and painful. This holds true with regards to the back as well. In individuals who spend most of the time in the office or at a desk, it is essential to have ergonomically designed chairs and appropriately positioned the tables to ensure that their back is straight at all times. These days, large companies have health and safety training videos that discuss back problems in individuals who spend a majority of the time at a desk. It is important for all people who have sedentary jobs to ensure that they have the appropriate office equipment such as chairs and tables that provide them with the right support and help prevent back pain. Sitting slumped on a couch or a chair can place a great deal of stress on the back. The constant stretching of ligaments and twisting and turning of the spine and discs can cause inflammation and this can result in pain. Maintaining a straight posture and the normal contour of the spine can help prevent back pain. When taking rest, it is important than the mattress that the person uses provides the right support to different parts of the back. These days, memory foam mattresses are available that mould themselves to the shape of the body and provide support in all the right places on the back. Using an old mattress lacks the support and can cause back pain. In women who have larger than normal breasts, low back pain can be an issue. The primary cause for this is a change in the centre of gravity which requires constant strain to be placed in the lower back. Wearing a properly supportive bra can help maintain the normal centre of gravity and prevent lower back pain. It is not uncommon to see table walking around with an overfilled shoulder bag to carry each and everything that they probably own in it. When carrying such a heavy bag, the brunt of the weight is borne by the back. This can cause back pain that can worsen if the bag is not made lighter soon. Smoking is well recognised as a cause for a number of different conditions in our body ranging from chronic lung disease to heart disease and cancer. Studies have shown that regularly smoking can cause problems with the spine and result in back pain. Stopping smoking can reduce this risk greatly. In individuals who have been diagnosed with clinical depression or who deal with a very stressful life on a regular basis, pre-existing back problems can flare-up and can cause back pain. Patients are often recommended to see a psychiatrist with regards to treating the depression and undertake an exercise program or some form of relaxation therapy to help manage the stress. It is not uncommon for individuals who tend to add poorly fitting shoes to develop low back problems. This is particularly the case in women who enjoy wearing high heels. It is recommended that patients were comfortable footwear that can maintain the arches of their feet and also prevent lower back pain. As it is seen above, there are a number of different causes of back pain. All of them are reversible causes and can be treated very easily.